Disclosure: I received a copy of this book to help facilitate the review. All opinions stated, however, are genuine and my own. "I See Me!" Personalized Children's Books are a wonderful way to make any child feel special. I love them because they are nice and big, the pages are a strong, durable quality, the pictures are gorgeous, and the story lines are engaging. You get to choose a book theme that you like from their quality selection, and it (the whole story!) will be written around the letters of your child's first and last names. Because of that, each story is individual and unique! 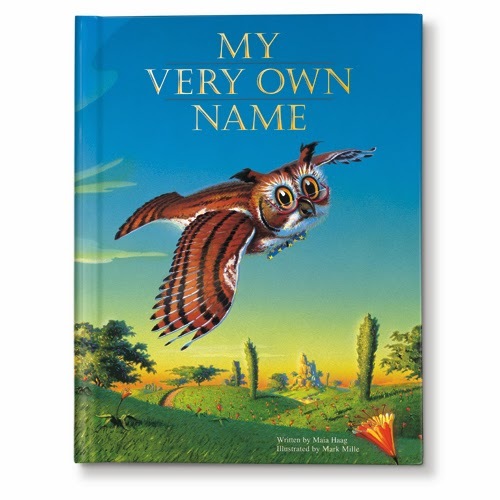 I had a chance to review the "My Very Own Name" book pictured above. My son has an unusual name, so getting things personalized for him makes him happy. The book I received, however, I had made for my nephew. Take a look at the page above and you can see how the letter 'U' was being portrayed in his name. The pages are colorful, the letters being added one by one adds to the suspense, and then when your child sees his/her name played out, that initial surprise, the first time they read it, is bound to bring a huge smile to his or her face. Word of warning: Be ever so careful with your information on the order form. I was not careful enough and my book has my nephew's first name in the book twice (as his first and his last name). That is obviously not good, and I won't be giving that book to my nephew after all. We all make mistakes we had no clue as to how they happened from time to time, so learn from mine and be careful to check, and then re-check your information before you hit submit. I honestly can highly recommend this book!! It is a most excellent concept, and is sure to become an instant favorite, and a book you will keep forever. I See Me! also has a great line of other personalized products. Some of the personalized lunch box selections offered. These have a chalkboard mounted inside! They also have these great personalized lunch boxes that have a chalkboard mounted on the inside so you can send notes to school with your child each day (I LOVE that concept!!). Some of the personalized puzzles offered. They have puzzles as seen above, and some really great gift sets, as shown below. Some of the awesome personalized gift sets that are available. Costco is featuring vouchers for these unique books at a 30% savings. Members can choose from seven titles to find the perfect story for a young book lover. Look for this deal at your local Costco (not available in all areas) or go online to www.costco.com and search for item 756683. Hurry! Limited time offer and orders must be placed by 12/8/13 for Christmas delivery. The 'I See Me!' books have won many awards, including Mom's Choice, Creative Child, Family Choice, Oppenhiem, iParenting, and Homeschool.com. They have also been given many media mentions. One lucky reader is going to win "MY VERY OWN NAME," the same book that I received. I like Personalized Pirate Bandana. I never knew they sold anything, but books. Cool! Too cool. And yes on the name thing. Got to be careful about so many things today. I love anything personalized, so I definitely want to order one for each of the boys for Christmas. I like the My Very Own Fairytale and the My Very Own Name. But these books are awesome. I'm totally using that Costco discount! I like it that you can have more personalized options nowadays. When I was growing up, I have a hard time finding my name on anything. It was always spelled without the H. Same with my daughter. We find a lot of Maria stuff, but no Mariah. We always just paint an H on whatever we buy lol. Every once in a blue moon my name would turn up somewhere. I have seen these books and they are great. It really makes a child feel special to have such a "big deal" made out of his/her name! What a delightful idea! I will head there immediately! One more day until Feathered Friend Friday, woot!! A good one to go for the little ones in your life. Oh how cute! This would be a great gift for sure. i love the books from them... love love them. I like their very Merry Christmas book. The "Who Loves Me?" looked adorable (mainly caught my eye because the example name is Jacob, my older boys name). My kids had personalized book once and LOVED it! I don't remember anything like this until my last two kiddos...then creating personalized items became much easier. There's probably a direct correlation with the Internet there. I think things like this are great. Those lunch boxes are so cool. Remember the old ones we had? I had a Wonder Woman one, and a Holly Hobby one. I really like the ideas they have as products. I like the pirate tale book. My Very Own Pirate Tale Storybook, my daughter loves pirates shes going to be one for Halloween. I love their products. My son has a unique name so getting him a book featuring his name would be so amazing! These product are wonderful! I had my son bring his in for his book in Kindergarten and all the kids were excited to see his full name in a book. I love I See Me! What amazing books ect. I think this is a wonderful product both my girls would love! I love the premis of this book--giving children a "good" view of themselves. I know of no child that does not like his/her name in print-and it does keep them more focused. I love the lunch boxes. So different than what most kids would have at school. Cool! I reviewed a book for them two years ago and loved it! I love this!! I don't have an unusual name but the spelling of it, Krystal, is not usually how it is spelled. Especially years ago when I was a kid. So my mother and I were always on the lookout for things with the correct spelling of my name. I remember I got a book like this as a kid and I loved it! Personalized books are such a treasure. My kids all have one of these and they are keepsakes. Personalized books are so great! This book is so neat! I would love to have this for my son. I also love the lunch box with the little chalkboard. That is such a cute idea. I am going to check out the website for Christmas ideas. We're really getting into all kinds of books now and I think something personalized would be really exciting for kids. From BabsProjects: These personalized books are cool and I think they would make great gifts too. I think this is such a cool idea. I mean, who doesn't like something with their name on it? I really love the whole idea of personalized items! For young kids it is important to encourage books and reading at a young age, so this is a great way to go. I really love these personalized books because kids love them and they really get kids wanting to read and to see their names in the text. Anytime that we can get kids excited about reading, it's a good thing. It helps to promote literacy from a young age. I have one of these for my daughter. I love the idea behind these books. I like the super incredible big brother. I really like their Super Incredible Big Brother book. I am going to purchase it for our Grandson who is going to be a big brother in December. Thank you for introducing me to this product. Thanks for the great giveaway opportunity. Keep up the terrific blogging. I love the I SEE ME books. My girls get so excited when they see their names. My Very Own Fairy Tale Storybook looks really cute! My son is just now recognizing his name on things so a personalized book would thrill him. DS is an emerging reader so anything that captures his attention is a hit for me! I love all of the other products, too, to grow with him. I learned that in addition to their great books, they have many, many other personalization options. I really like the personalized board books. My son would love that. Fingers crossed! I would love a pirate or fairytale book for my daughter for christmas... wish I could afford it! I like their Outerspace Personalized Puzzle! Thanks so much for the fantastic giveaway! I like the Personalized Pirate Bandana, my 5 yr old would love it! It's so cool to have a personalized book for kids! I think it can give them a boost to see their name in print! I like their Super Incredible Big Brother book! My son would love that! I love the My Very Own Fairytale book! I love the My Snuggle Bunny Gift Set! I love the personalized books! The My Very Own Fairy Tale Storybook is one that catches my eye. Im sure all children would love anything/everything on the site. Im also sure my grand daughter would really enjoy reading a book with her name in it. I really like those metal lunchboxes! My Snuggle Bunny Gift Set looks perfect for my granddaughter! "Who Loves Me?" is my favorite! My little Emeline loves things with her name on it, but it is impossible to find. She would just be thrilled to get this! I like the My Snuggle Bunny Gift Set.